The map, created by researchers at Carnegie Mellon University's Community Robotics, Education, and Technology Empowerment (CREATE) Lab, shows the movement of refugees. A new data parser to directly access the UNHCR database which provides extending of the time horizon to include the latest available numbers and also includes internally displaced persons. 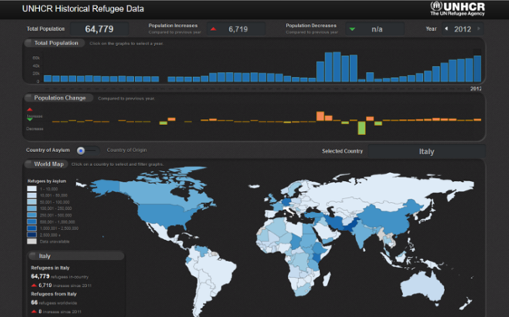 Source: blog.csaladen.es/refugee/ FULL SCREEN! This map shows the estimated net immigration (inflows minus outflows) by origin and destination country between 2010 and 2015. 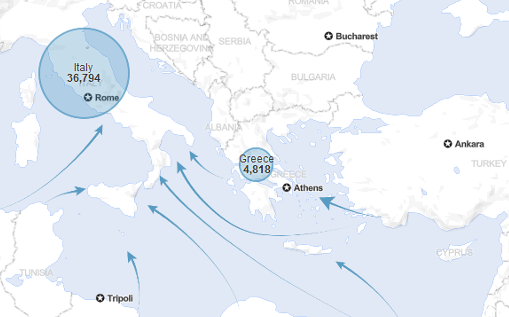 Blue circles = positive net migration (more inflows). Red circles = negative net migration (more outflows). 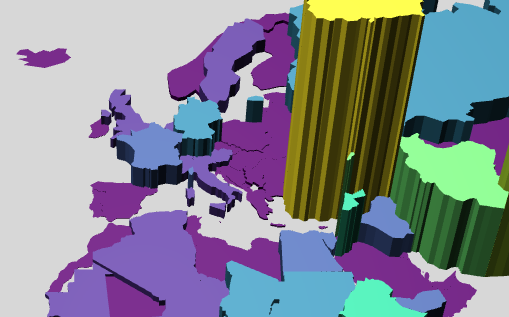 Each yellow dot represents 1,000 people. 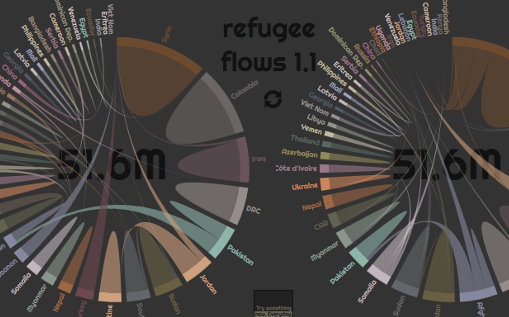 Explore UNHCR's historical refugee data with this interactive data visualization. The EU’s 11th Common Basic Principle on Immigrant Integration policy (2004) states that developing clear goals, indicators and evaluation mechanisms are necessary to adjust policy, evaluate progress on integration and to make the exchange of information more effective. 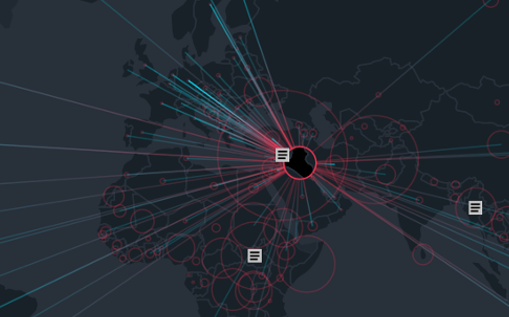 This map shows how the world’s 16 million refugees are distributed by country. Asylum seeker and refugee data from the UNHCR: Asylum seekers monthly, UNCHR Statistical Yearbook 2015. The data presented refer to detections of illegal border-crossing rather than the number of persons, as the same person may cross the external border several times. However, there is currently no EU system in place capable of tracing each person’s movements following an illegal border-crossing. 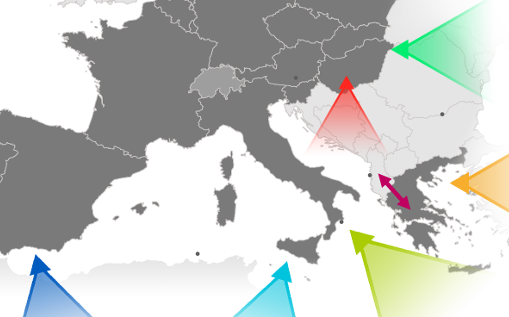 The Migrants' Files project was launched in 2013 by a group of European journalists and researchers who joined forces to quantify the deaths of immigrants seeking refuge in Europe and identify the locations of these tragedies on maps. EU Emergency Relocation Mechanism, stanje na dan 27.09.2017. Godine 2016. gotovo 66 milijuna osoba je prisiljeno napustiti svoje domove zbog sukoba i progona - jedna od svake 113 osobe na planeti. 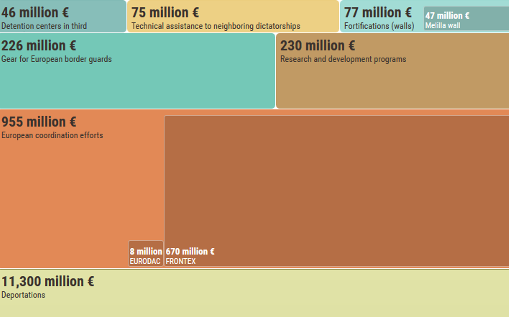 Refugees and migrants spend over €1 billion a year to reach Europe. Europeans pay a similar amount to keep them out.